Dental Specialists are essential members of the Army dental care team. They assist Army dentists in the examination and treatment of patients, as well as help, manage dental offices. This job, military occupational specialty (MOS) 68E, is open to those without dental degrees. Much like their civilian counterparts, dental specialists act in support of dentists in just about all aspects of treating patients and running the dental office. They’re tasked with preparing dental procedures by selecting and arranging instruments and prepare patients by recording vital statistics like blood pressure. These soldiers are usually part of patient oral exams, may help with such tasks as administering anesthesia, placing and removing sutures, and preparing materials for dental impressions and restoration procedures. Dental specialists in the Army also assist with X-rays, which includes preparing the patient. They do a fair amount of the administrative work around the dental office as well, including ordering and taking inventory of supplies, scheduling appointments, and filing and maintaining records. They'll also supervise and assist subordinate personnel in the dental office. Job training for a dental specialist requires ten weeks of Basic Combat Training and 30 weeks of Advanced Individual Training, including practicing dental care tasks, a bit longer than the typical individual training due to the highly specialized nature of the work. 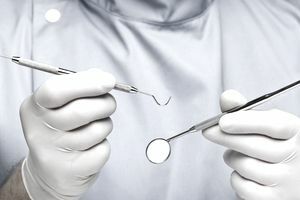 You'll learn preventive dentistry, dental office procedures, radiology techniques for X-rays and dental hygiene procedures as part of your training to be a dental specialist. You don't need prior experience in dentistry or as a dental technician, but an interest in learning about the field will be important. To be eligible as a dental specialist in the Army, you need a 91 on the skilled technical (ST) portion of the Armed Services Vocational Aptitude Battery (ASVAB) test. No security clearance is required for this job, but you'll need normal color vision (no colorblindness). This Army job is excellent training for several careers in the dental field. You may need to check the requirements for local licensing in your area, but you should be qualified to work as a dental assistant, a dental hygienist or a dental laboratory technician after you leave the military. Although you'll need to attend dental school and earn a DDS (doctor of dental surgery) degree or equivalent, MOS 68E is also a great way to begin the path to becoming a dentist.